Simulation of parallel beams of light striking a parabolic reflector whose curvature varies over time. 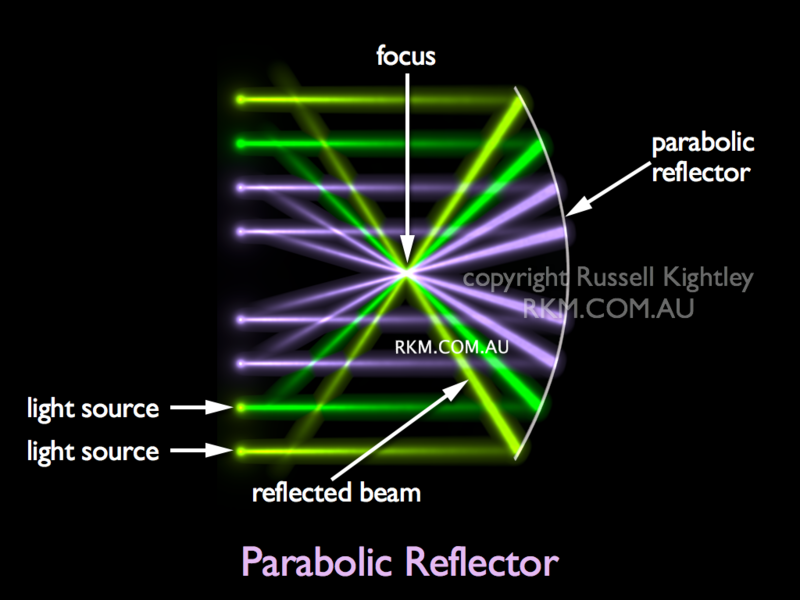 Notice how the light striking the parabolic reflector is brought to a single focus in front of the reflector. As the curvature varies, so the focal point shifts. The fact that all of the parallel beams (light rays) are brought to a single focus is very important. It is why large reflecting telescopes use huge parabolic mirrors to collect distant starlight. Satellite dishes (and radio telescopes) use parabolic collectors to collect radio waves. The detector is then positioned at the dishes focus. Compare with its inverse the convex mirror.